The Araucariaceae family of conifers contains many odd and unusual trees. It is a very primitive family of conifers – they flourished during the Jurassic and Cretaceous periods, and they retain their Jurassic look. The 41 extant species are scattered throughout the Southern hemisphere, from the ancient monkey puzzle forests of Chile and Argentina to a secluded grove of the ancient Wollemi pine tree in an Australian canyon. At first I intended to devote this article to the monkey puzzle tree (Araucaria araucana). However, I soon discovered that the monkey puzzle is part of a family of similarly odd trees, and I expanded this article to cover all the oddities of Araucariaceae. The monkey puzzle tree itself is a hardy conifer that is native to Chile and western Argentina. They can grow to be over 100 ft. tall and live to be over 1000 years old. They grow cones that release seeds similar to large pine nuts; monkey puzzle trees would actually make an ideal food crop if it were not for the three to four decades it takes for them to mature. 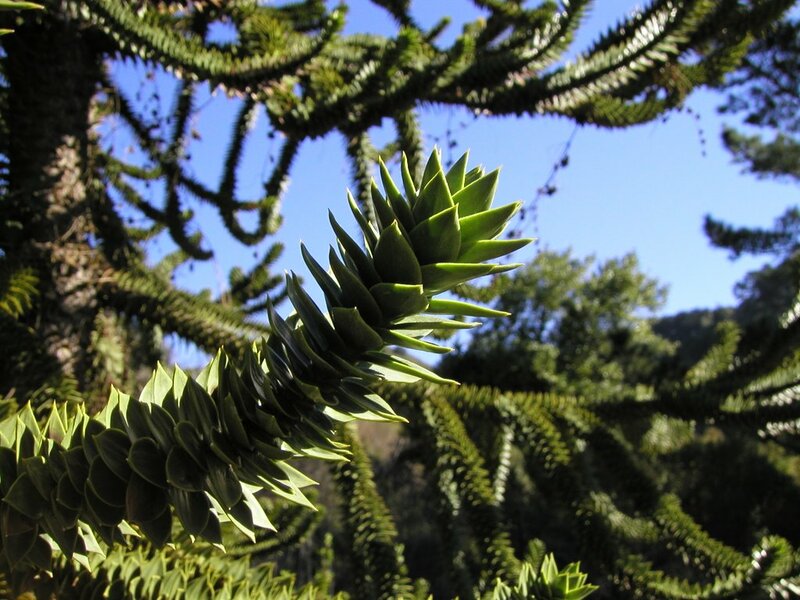 Long past – Fossils of plants very similar to the monkey puzzle tree, Araucaria araucana, have been found dating back to the Jurassic Period 150 million years ago. The leaves of the tree are thought not to have evolved to ward off monkeys (which don’t live in its natural habit) but to discourage dinosaurs from eating its branches! Wollemia nobilis, or the Wollemi pine tree, is the last living member of its genus, though Wollemiafossils dating back 200 million years have been discovered. The scattered distribution of Araucariaceans can be explained by their past. Once widespread throughout the world, most died out along with the dinosaurs. Some, however, survived in (a more hospitable) Antarctica, from which they spread to many areas in the Southern hemisphere. Most of the populations remaining today are relics of past populations. A grove of Wollemi pine trees discovered in a canyon in Wollemi National Park, near Sydney. Large cones – The bunya-bunya tree, Araucaria bidwillii, found in nature reserves in Australia, grows some of the largest cones of any conifer. The cones can grow up to 35 cm. (over a foot) in diameter and weigh up to 10 kgs (22 lbs) (although a more typical weight is apparently 4.5 kgs (10 lbs) according to WaynesWord). The germination of bunya-bunya seeds is also very unusual – they form underground tubers, waiting for optimal conditions before they actually sprout aerial shoots. Many other Araucariaceans grow large cones as well. Bunya-bunya seeds served as a food source for Australian Aborigines. The cones of the dammar pine, Agathis robusta, are also very large. The dammar pine is unusual among conifers in that its leaves are broad rather than needle- or scale-like. Great height and age – Most Araucariaceans grow over 100 ft. tall. The tallest Wollemi pine tree (nicknamed King Billy) is 130 ft. tall; monkey puzzle trees and bunya-bunya trees over 150 ft. tall have been reported; and most exceptionally, an Araucaria hunsteinii 292 ft. tall was supposedly discovered in New Guinea. Along with their great height Araucariaceans apparently also attain very old age. Many species live to be over 1000 years old, and almost all can live to be over 400 years old. More Information: Once again, I owe almost everything on this page to the information on Wayne’s Word. However, many tree enthusiasts have posted information on the web about Araucariaceans. I also highly recommend reading the Wikipedia articles for general information on the genera and family.